Ahh! It's OwlCrate time!!!! These posts always bring me so much joy to share with you guys, and honestly, I took way too many photos of this box. It was just too darn beautiful for lots of words alone. Stay tuned till the end of this post if you'd like to see an absolutely silly video I made about the upcoming July OwlCrate and get a discount code! 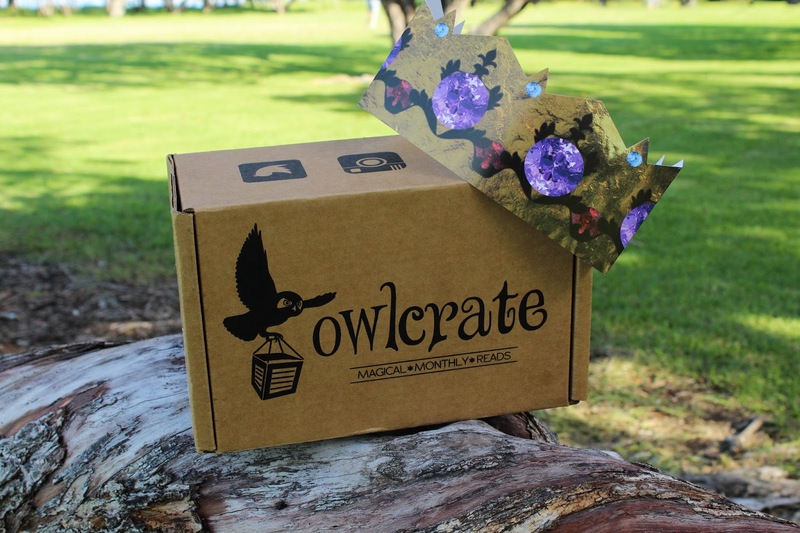 If you're here and you're unsure about what or who OwlCrate is, let me fill you in! 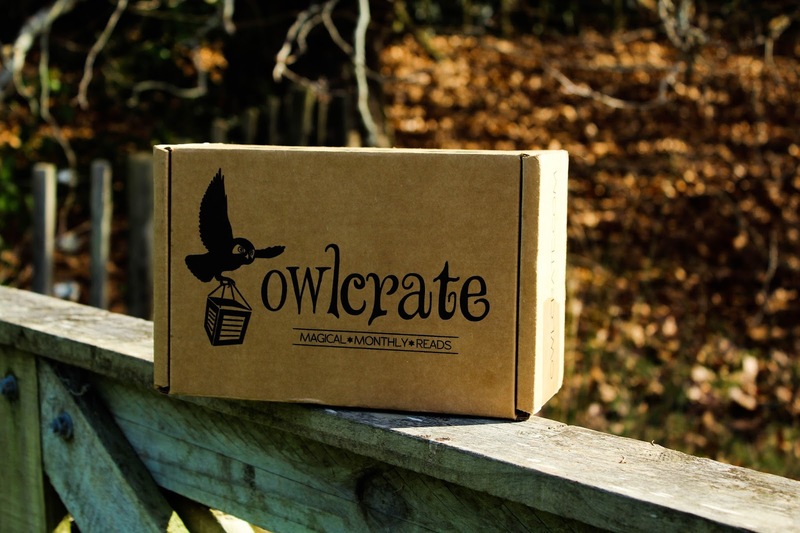 OwlCrate is a monthly Young Adult subscription box. Each month, creators Korrina and Robert (plus their team of phenomenal helpers) put together a box that suits a certain theme. The boxes are $29.99USD a month + shipping and include: one YA hardcover book (usually US edition), 2-5 bookish goodies, and some book/author swag! It's absolutely fantastic and I can say without a doubt in my mind that OwlCrate is one of my favourite subscription boxes out there. 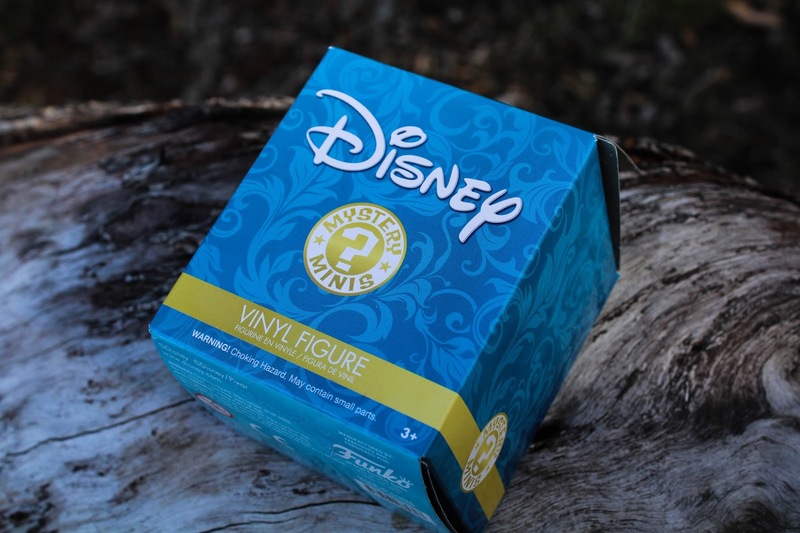 One of the items I was most excited to receive was the Disney Mystery Mini Vinyl Figure by Funko. These figures are full of wonderful details and the options were a heap of disney Princesses/Queens and their animal/magical companions. You could end up with one of many different options like Princess Jasmine from Aladin or Flounder from The Little Mermaid. If you watched my snapchat story when I unboxed this beauty, you'd know I was a little bit disappointed. I 100000000% adore Princess Ariel, I have a slight obsession with mermaids that I think a lot of you will be aware of. Alas, I didn't receive Ariel (and was insanely jealous every time I saw someone did. I thought that I'd go buy a few more of these mystery mini's and see if I could nab an Ariel but unfortunately they're $17.99 a piece in NZ, when the full size ones are $24 (so shocking!) It goes to show that OwlCrate definitely brings items that are worth the money you'd spend on the box. 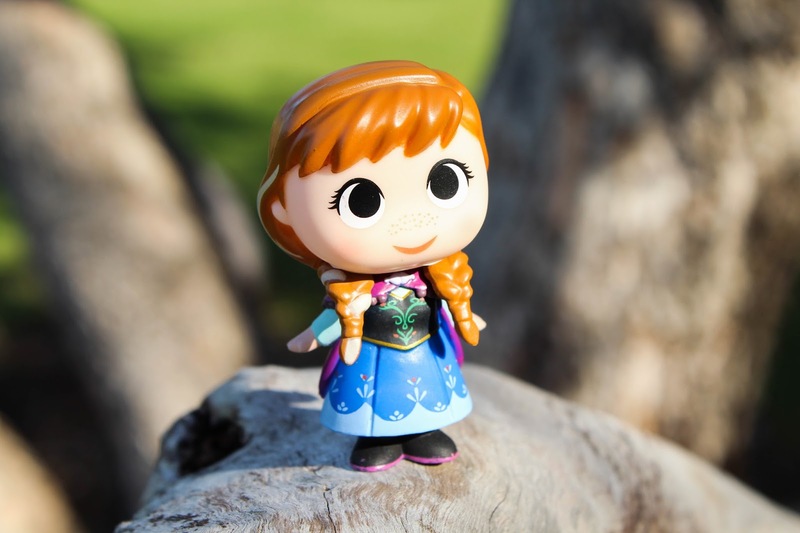 I know I said that I was disappointed in my Funko, but to be honest, Princess Anna is fabulous, so full of detail and look how cute she is! 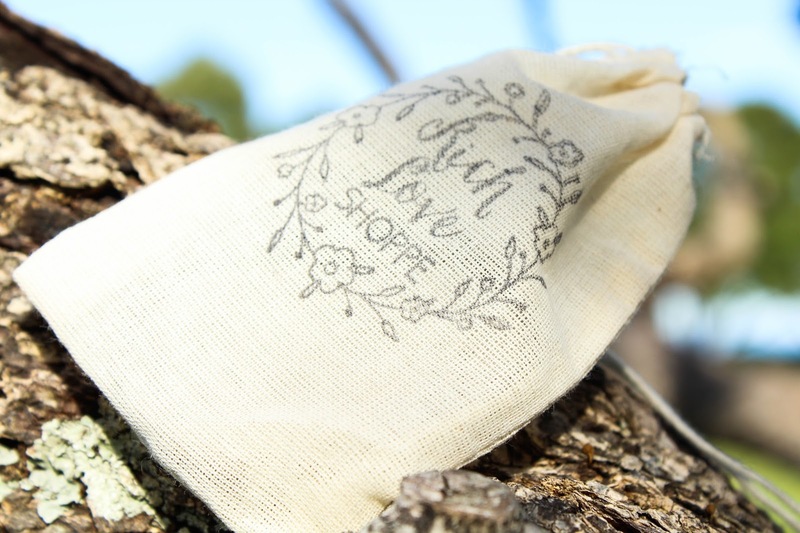 Next up was an adjustable cuff bracelet from Rich Love Shoppe that I fell in love with at first sight. I ended up taking around 50 photos of this beauty, but I'll only show you two... If you're lucky. 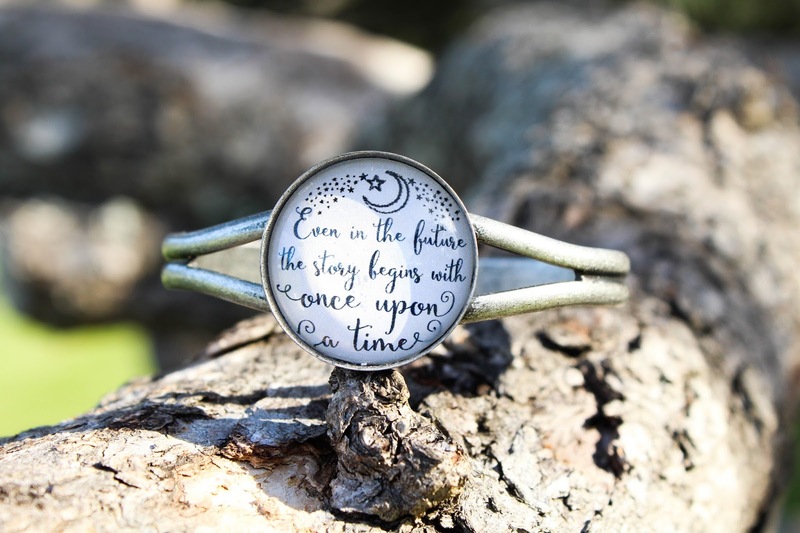 The Quote on the cuff reads 'Even in the future the story begins with once upon a time' which is a quote from Cinder (The Lunar Chronicles). 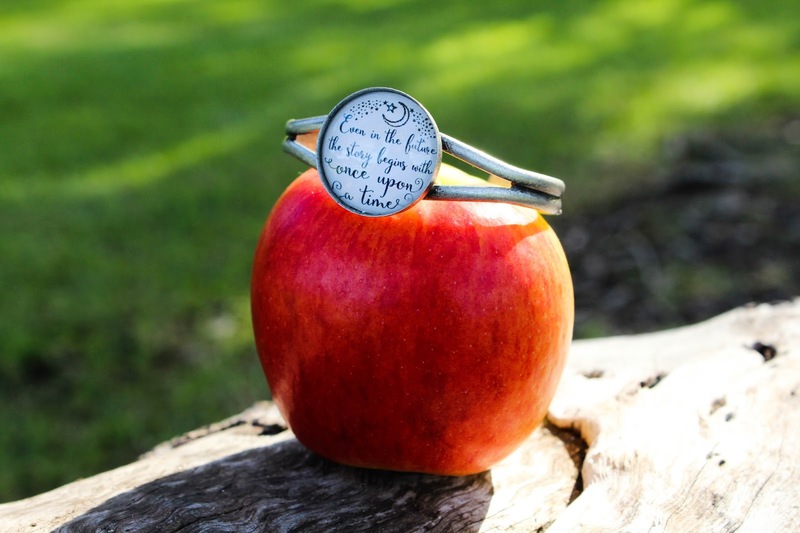 When it comes to quote based bookish jewellery, I have to say that I usually prefer the quotes to be written as they were on the page, so it looks as though it was cut right out of the book, but every time I look at this bracelet I fall more and more in love, I mean, I even got an apple to photograph it on! 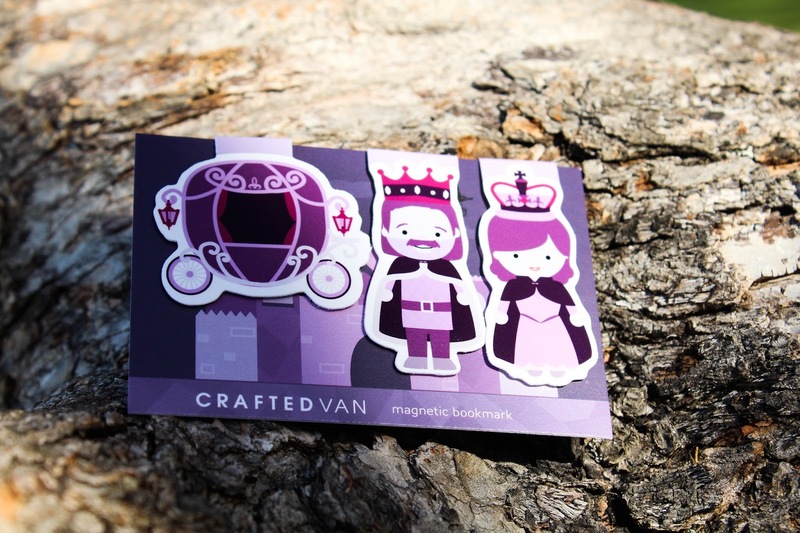 Also included in the box were these adorable mini magnetic bookmarks from Craftedvan. I've seen their bookmarks absolutely everywhere but hadn't got round to actually purchasing some for myself, so it was awesome to receive some in this month's OwlCrate. Straight on the string of magnetic bookmarks they go! Honestly, I don't find myself using magnetic bookmarks all that much because for some reason I find they're not very easy to attach to the book pages (is it just me?!?) but I'm happy they'll become a part of my ever growing collection. Not being able to use them definitely hasn't stopped me buying them in the past and I think I'll continue to do so. 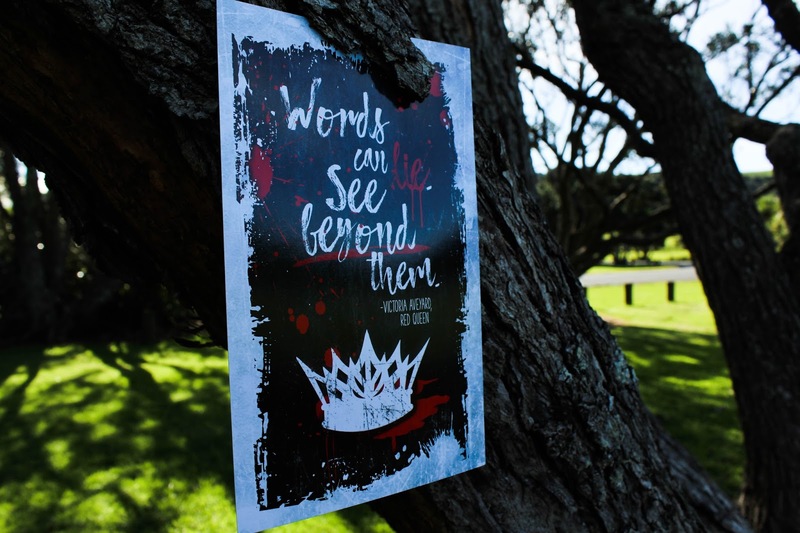 Here we have an art print created by EvieBookish which is inspired by Victoria Aveyard's 'Red Queen' which was such a great read! The quote is dark and is shown beautifully on the print. It's been done on very sturdy card which means it'll hopefully stand the test of time up on my wall and if it falls to the floor it won't bend. It reads ' Words can lie, see beyond them." This wasn't really an item, but I'm so happy with it all the same. 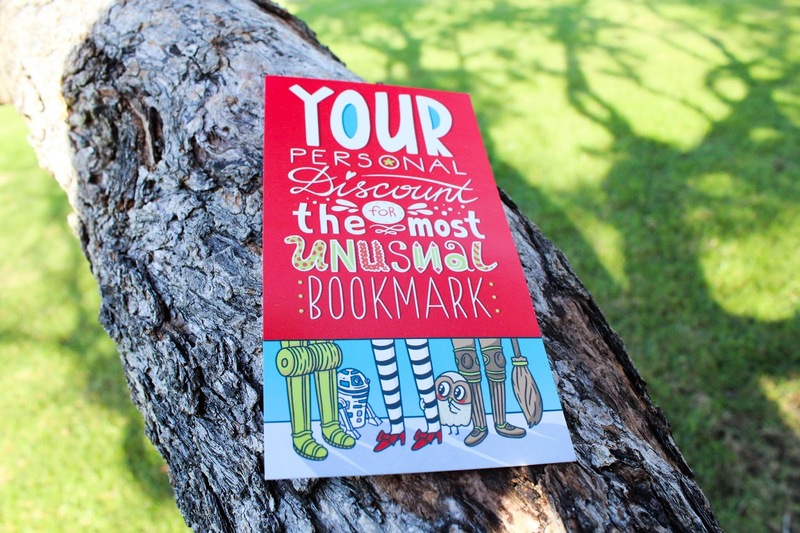 This is a $10 off discount code for MyBOOKMark which is a fantastic company! I currently own the Harry Potter one and use it all the time. I've had my eye on the mermaid's tail for the longest time so I might just have to since the discount is totally twisting my arm (hehe). If you haven't checked out Olena's work make sure you do it soon! 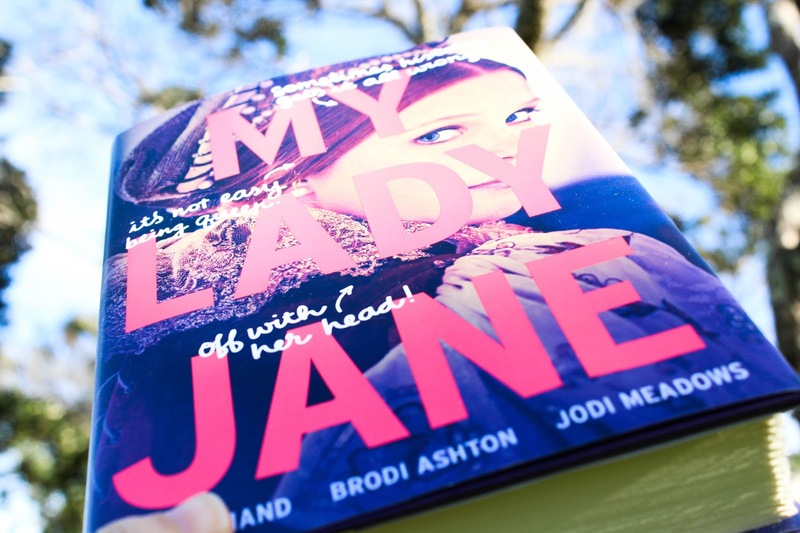 At sixteen, Lady Jane Grey is about to be married off to a stranger and caught up in a conspiracy to rob her cousin, King Edward, of his throne. But those trifling problems aren’t for Jane to worry about. Jane gets to be Queen of England." The book is pretty freaking huge (around 500 pages) so it should keep you entertained for a while if you choose to pick it up. Better yet, it has deckled edges *swoons*. 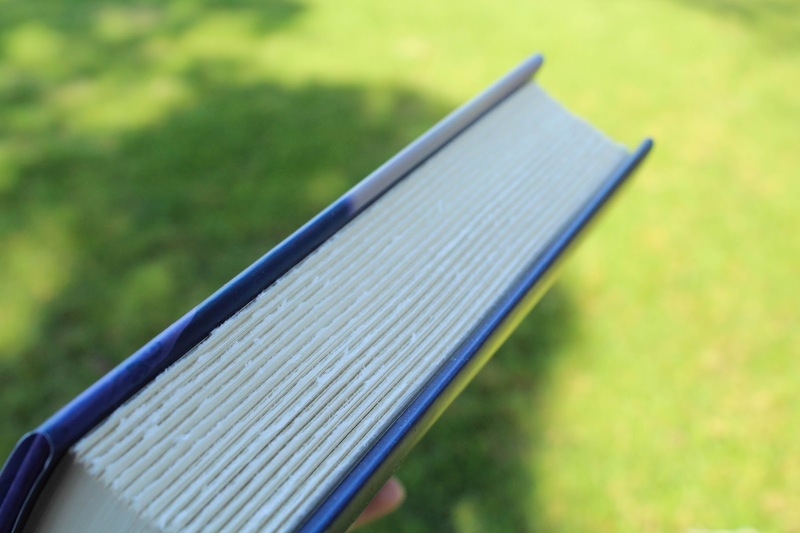 If there's one thing I love, it's deckled edged pages. 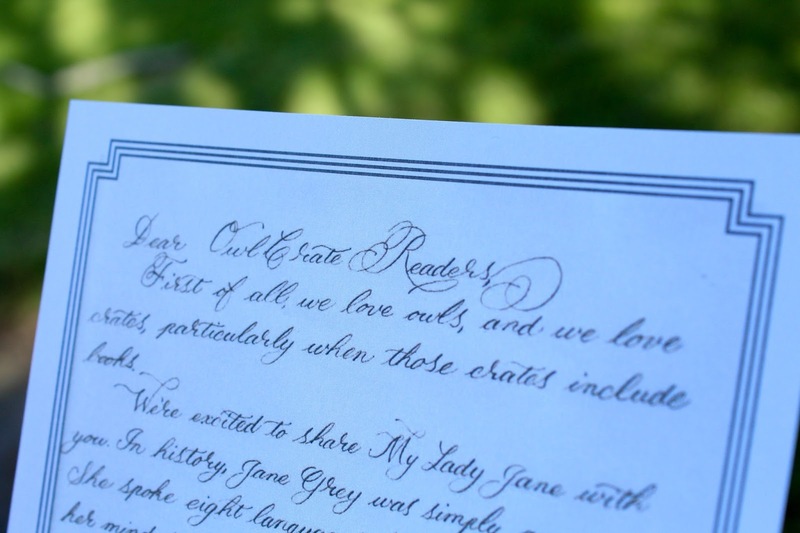 We also received some book swag in the form of a letter from the author's and a card crown! I was honestly really impressed with the content's of this month's OwlCrate, as I always am. My favourite item has to be the bracelet, I can definitely see myself wearing it and I cannot wait to the give book a go. July's theme is Good VS. Evil and I cannot even begin to explain how freaking thrilled I am to be receiving that box! I even made a video to explain my deepest love of OwlCrate's idea which I'll share below. OwlCrate has said "This is a very special box. We will be sending out two different boxes. One box will be inspired by our favourite heroes, and the other will be inspired by our favourite villains. It is a complete surprise which box you will receive, and we can't take requests for a certain box. Each box will contain the same book and exclusive promo items though! Both boxes are equally awesome and have very similar items and equal value. The book we'll be sending next month is an incredible read about humans and monsters, and the blurred lines that separate the two. This is an extremely anticipated release and we can't wait to send it out! Also, if you like Harry Potter, Star Wars and Alice in Wonderland, this is the perfect box for you!" I am so, so, so, so, so excited for this box. I can barely contain myself (hence the ridiculous video you're about to see). If you'd like to sign up for OwlCrate you can use the code BKWORM15 to receive 15% off your first box or on a gift order for a friend. Head to the OwlCrate website and enter the code at checkout. We've already been told that the July box will contain a full sized Pop! Funko *starts screaming! * There will only be a few July boxes left as spaces for this month are limited so don't miss out! Well, I hope you enjoyed that as much as I enjoyed making it! Thanks to OwlCrate for sending me another amazing box that I was more than happy to review! 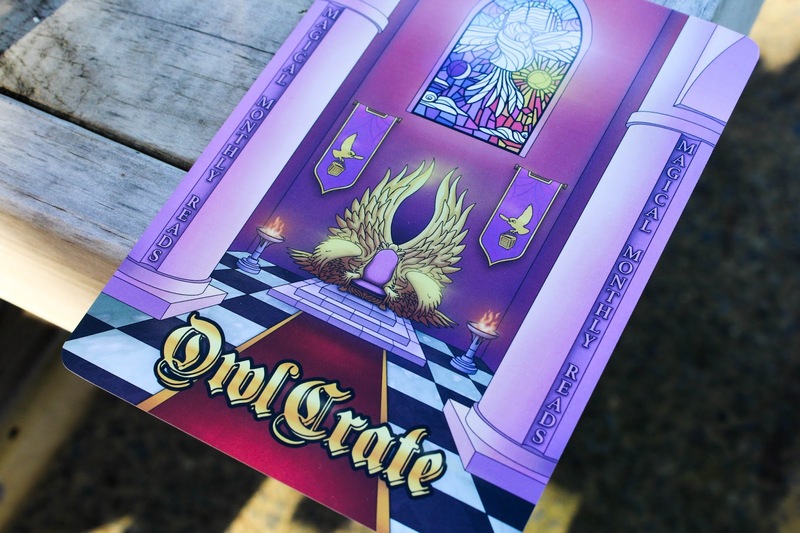 If you want to stay up to date with all of OwlCrate's updates, special previews, giveaways, competitions and more. Also, from now until July 5th OwlCrate is hosting it's third rep search, more details can be found here. Thanks for reading, guys! Did you receive a June OwlCrate? What did you think? Which item was your favourite? Let me know in the comment section below as I love hearing from you!